Sunday September 29 1907 It was late when we got up so the forenoon was not long [illegible] I had dinner early for Lizzie to go down to see her Father at 12.37 I did some things after dinner that I had been neglecting and read and wrote a little. Lizzie came back at 5.30 We had supper and visited all evening. 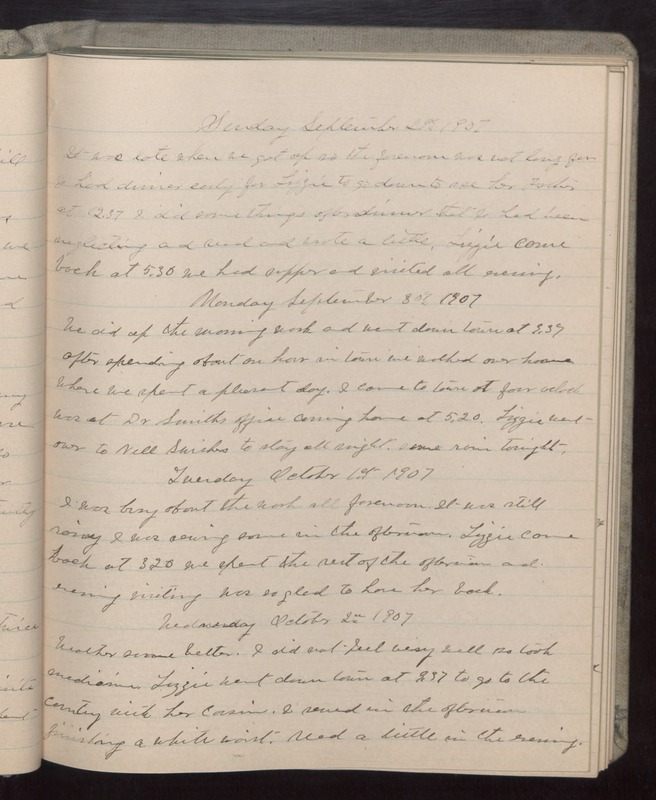 Monday September 30 1907 We did up the morning work and went down town at 3.37 after spending about an hour in town we walked over home where we spent a pleasant day. I cam to town at four oclock was at Dr Smiths office coming home at 5.20. Lizzie went over to Nell Swishers to stay all night. Some rain tonight. Tuesday October 1st 1907 I was busy about the work all forenoon. It was still raining I was sewing some in the afternoon. Lizzie came back at 3.20 we spent the rest of the afternoon and evening visiting was so glad to have her back. Wednesday October 2 1907 Weather some better. I did not feel very well so took medicine. Lizzie went down town at 3.37 to go to the country with her cousin. I sewed in the afternoon finishing a white waist. read a little in the evening.